Tilbury Fort is one of the finest examples of 17th century engineering. It was designed by Sir Bernard de Gomme who was Chief Engineer and Surveyor General of Ordnance to King Charles II. It is situated at a point on the River Thames where the width suddenly reduces to 800 yards and was the first line of defence for the Thames and London. 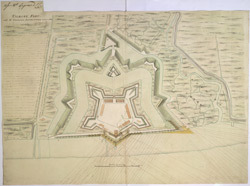 Fourteen large guns were mounted along the river bank and a double line of moats protected the fort being attacked from any landward direction. The fort had two large magazines that stored vast quantities of gunpowder.